﻿ Spicynodes : Why pay? Home > About > Why SpicyNodes? > Why pay? IDEA has made SpicyNodes freely available as a public service to encourage and support online communication and educational efforts. Individual memberships are free. We have an extensive cookbook to help you get started. We’ve also built a gallery of nodemaps created by the SpicyNodes community that enable authors to showcase information and visitors to explore that knowledge. Reasonably priced Organization and Enterprise memberships are specifically designed to meet the needs of organizations, businesses, and institutions. With these paid memberships, you can have access to more visual styles, remove the SpicyNodes watermark, use password protection, host node content or media files from your own servers or intranet, receive priority support, and create groups to keep track of everyone’s work. Plus, you gain the satisfaction that comes from supporting SpicyNodes and IDEA’s ongoing research. With your paid Organization membership, the SpicyNodes watermark will not appear on any nodemaps you create online. (In order to remove the watermark when you use the API, upgrade to an Enterprise membership). Your paid membership enables you to password protect your nodemaps, with any password you want, and a clue or request that prompts users to enter the correct password. Paid memberships allow you to share your nodemaps with others and edit your nodemaps collaboratively. You can take turns editing, each from your own account. If you manage a workgroup or class, you can easily keep track of other people’s nodemaps. For example, you can see all of your students’ nodemaps at a glance, and even reset students’ passwords if they lose them. Organization and Enterprise members have tremendous control over the style of nodemaps, thanks to a powerful visual editor. This makes it easy for your nodemap to fit seamlessly into your site. You can tweak or customize many aspects of your nodemap’s style. 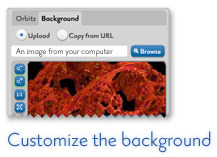 You can upload any background image to add visual interest or to blend the background of your nodemap with the rest of your site. Browse an extensive library of fonts, choosing appealing typefaces for various node elements. There are several families of node shapes, each with a variety of controls, from funky and playful to serious and professional. Choose colors to fit any site and any mood. You can set colors for over a dozen different attributes (e.g., the edges of nodes, the fonts, the panels). You can also generate colors by creating automatic color harmonies, or loading the main colors from an image. Interaction sounds are an optional, fun addition to your nodemap. You can easily create soundscapes, triggered as users point, click, drag and manipulate your nodemaps. To help users navigate, you can choose several different navigation panels, and whether or not to display other items on the screen (such as home, previous, next, or zoom buttons). When you explore a palette of infinite styles, you can easily keep track of old styles by saving them online, or via importing and exporting. If you are technically inclined, the exported files are in an understandable XML format, which you can manually customize and re-upload. With Organization and Enterprise memberships, you can save multiple versions of your nodemaps online, and also make global changes (e.g., resetting all the colors of your nodes, setting an image for all nodes, or performing global search-and-replace for text). 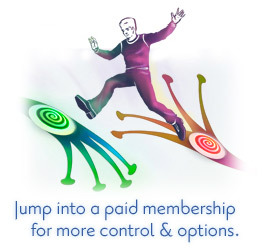 Enterprise memberships have two primary advantages over Organization memberships. First, for high-volume sites, Enterprise members enjoy lower pricing ($0.25 per 1,000 views, vs. $1 per 1,000 views).